Well, I’m heading to Ralph Wilson Stadium Sunday for the clash of the AFC East titans as the Bills host the Jets. I’ve got a pretty good idea what I’ll be cooking for our tailgate, but I haven’t decided yet on whether I wish to be mildly mocked by the Bills fans or severely mocked. My Joe Namath jersey will bring mild but respectful mocking, but the Mark Sanchez jersey I recently bought for $10 will certainly bring a cascade of derisive (and potentially lewd) commentary. enforce a “Wait for the Whistle” policy for guests returning to their seats. to return to their seats. WTF? The vomitory? Having been to games at “The Ralph” I’ll tell you this: it would be difficult to define any single area as tyhe place where people vomit. The Latin word vomitorium, plural vomitoria, derives from the verb vomō, vomere, “to spew forth.” In ancient Roman architecture, vomitoria were designed to provide rapid egress for large crowds at amphitheatres and stadiums, as they do in modern sports stadiums and large theatres. So, there you go, you really do learn something new every day — but just in case, I’m going to avoid standing in the vomitory. The truth is more disturbing: I started drinking light beer. This really is the golden age of beer. There are great variety of obscure and delicious craft brewed products around, but more significantly there is very good beer right in the cooler at your supermarket. Why would you buy a six pack of Budweiser — or Corona, God help us, which is beer bought by people who want to seem cool, but are not — when there are so many better choices. If that makes me a beer snob, so be it. But in the face of all that, in an effort to trim calories and carbs, I turned to something contemptible: Coors Light. I hesitate to call Coors Light beer at all; beer-like would be a better description. That’s not to say it doesn’t have a place in society: Coors Light is not a bad thing to have on a sweltering summer day after cutting the lawn, because it is so much like drinking water. Many people have compared drinking Coors Light to quaffing horse urine, but I disagree; horse urine is surely more flavorful than this insipid stuff. Anyhow, now that I’ve reached my goal, I believe I’ll go out and get a 25 ounce bottle of Ommegang’s Hennepin Ale. Cheers! Albany has re-routed its St. Patrick’s Day Parade, hoping that steering the procession away from the bars might create a more family friendly atmosphere. That’s an idea, but I’m not sure that moving a block away — less than a two minute walk — will make much difference. Just in case you’re not sure you’ll be able to navigate between the parade route and the strip of taverns that line North Pearl Street, here’s is a map you can use as a handy reference. According to my calculations, it’s a whopping 463 feet from State Street to the Pearl Street Pub. If that seems too far, just stay right on the corner of State & Pearl and go to Savannah’s. If I were a betting man, I’d wager they’ll see record business tomorrow. 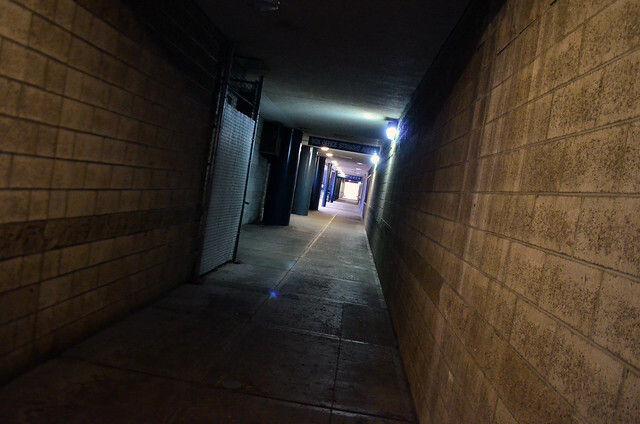 I take a shortcut through a walkway in downtown Albany that takes me below the steps in front of the Times Union Center. When I started walking this way, I noticed that every single morning there was a guy out here with a bucket and mop cleaning all around the dark nooks and crannies. Wow! They do an amazing job of keeping this place tidy, I thought. It smells like bleach — which to me is the odor of CLEAN. Then one day the bucket and mop guy wasn’t there — and the entire area reeked of urine. Ackkkk! Apparently, this is Albany’s favorite spot to urinate, which makes perfect sense. There are a couple of bars nearby and lots of street people — not to mention all the beer drinking at the arena — so the urinating is understandable. Because I always have to go to the bathroom, I find this interesting — but just for the record, I do my best to find a bathroom. I think the mayor should stop down here and have a look; if we clean up around Albany as if people are peeing everywhere, it would surely be a better place. And the mayor could stop worrying about Alex Trebek dissing the city. Hawke is something of a legend when it comes to drinking beer, and once held the world record for drinking a yard of ale — in eleven seconds. This brings us to the Granite State of New Hampshire, where voters must ask themselves this question: do we want a leader who won’t drink even one beer, much less 2.5 pints of beer in eleven seconds? Yes, that’s a terribly superficial and absurd way to judge Mitt Romney, whose Mormon beliefs forbid him from imbibing — but what about this campaign season has not been terribly superficial and absurd? Is Beer a Clear Liquid? You see, I had been wondering the same thing just hours before as I examined the prep instructions for my colonoscopy. The guidelines are very specific about consuming only clear liquids, but as you can imagine, the gastroenterologist isn’t going to include beer on the list. Broth, bouillon, juices? Yes. Beer? No. But it doesn’t say don’t drink beer, does it? After your prep, the results should appear clear yellow or clear green liquid with no solid matter. Oh, what fun. I suppose this is the price one must pay for living until 50. The indignities have commenced, and will hereby continue until death. By the way, I asked for a videotape of my scoping to put on YouTube, but that was a no-go. It seemed like the perfect thing to watch while enjoying a clear liquid. I was the designated driver when we went to a Halloween party Saturday night. I am more accustomed to being the designated drinker. Now pardon me for overstating the obvious, but Halloween is much more fun if you’ve been drinking. Sure, the costumes and hi-jinx are amusing at first, but there is no question that alcohol makes people and situations a lot more interesting. I was dressed as a Jedi Knight — and the absence of booze made for an appropriately sober and serious portrayal. People kept coming up to me and saying or doing crazy sh*t, to which I nodded in sage understanding, occasionally brandishing my light saber. After trying Jedi mind tricks on several party-goers, it was clear that The Force can have a strong influence on the weak-minded, but it’s not much use when dealing with the intoxicated. Don’t get me wrong, I don’t need alcohol to enjoy myself. Many of the best times of my life did not involve any drinking. But going to a Halloween party that way is like turning on the fluorescent lights at closing time. Things look scary.